Q. Does it cost anything to adopt a cat or kitten? A. Yes. There is an adoption fee of around $65. That helps us make sure people are serious and committed to adopting and also helps cover the cost of vet care (all our cats are spayed or neutered and have some of their shots before adoption). We sometimes run specials. Follow us on Facebook to learn about specials. Q. How soon can I get my new cat or kitten? A. If you've turned your adoption application in at Fort O Petsense, they can look it over while you wait. If they see no problems and the cat you want is in the store you'll be able to adopt immediately. If the cat is in one of our foster homes, we'll make arrangements to meet you with it. Q. Why do I have to sign a contract? A. We assume a long-term commitment to animals we rescue. Your contract will include things like what to do if you can no longer care for your cat (return it to us) and certain standards of care you agree to. - Go to Petsense of Fort Oglethorpe where there are usually 15-20 cats that need homes. - Follow us on Facebook where we post pictures of the cats we have for adoption. - Check Petfinder.com where we list and picture our cats. 2. Fill out an adoption application online or print one to fill out and send by email or mail (ngaa.animals@gmail.com or PO Box 5484 Fort Oglethorpe, GA 30742). 3. Once your application is approved, you'll have to sign an adoption contract and you'll be able to get your new cat or kitten. How to prepare your home for your new kitty. We also do monthly adoption events at Petsense in Fort Oglethorpe. Follow us on Facebook to learn more. 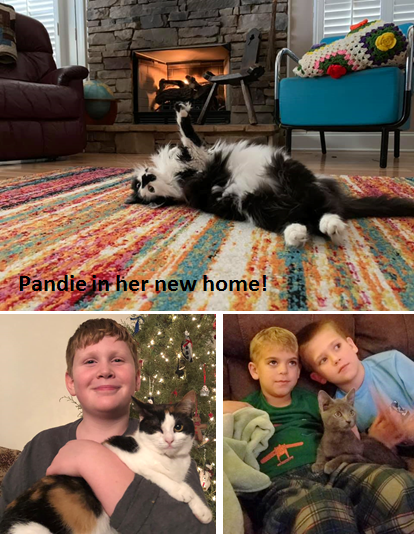 More happy adoption pictures here.